The Spanish capital wore its winter style well during Mercedes-Benz Fashion Week Madrid, where the response to near-freezing temperatures was a quirky array of fur jackets, vests and biker looks. Black was the color of choice for leather pants, stretch jeans, leggings and even short girly skirts that revealed bare legs. The only reason we’re telling you is because fashionista Maya Hansen did something a little different. Maya Hansen, a designer of the most promising and one the most solid of the Spanish fashion industry, proposes a new clothing line for women bikers of XXI century. 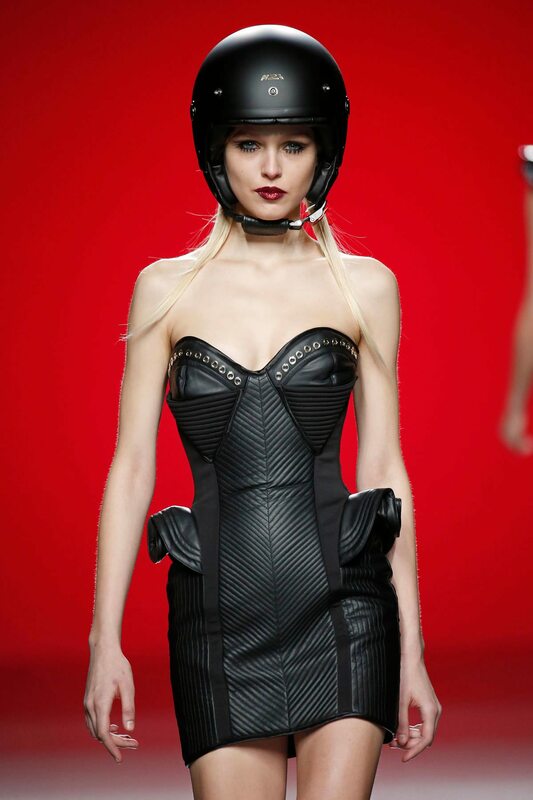 We’ve never seen motorcycle helmets at a fashion show runway before, have you? Previous: Who is Victoria Merideth? Think your helmet isn’t stylish? Think again! Va Va Vroom!